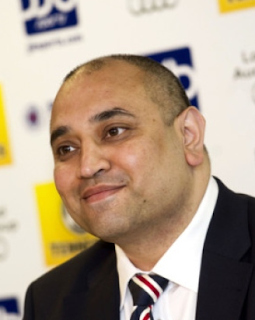 There have been a number of questionable assertions made by people connected to Rangers over the past few years but the line pushed by Imran Ahmad over the past week that he wants “nothing but the best for the club” is possibly one of the most laughable. Ahmad, the former Commercial Director of Rangers, has gone on something of a charm offensive this week. He has contacted Rangers bloggers in an attempt to portray himself as the good guy. If you were to take this nonsense at face value, you would be forgiven for thinking he was a lifelong Rangers fan who got involved in the club simply to see it delivered safely from financial turmoil. The facts don’t really back up this ridiculous assertion though. Let’s start first of all with some of his more recent activity. The Rangers Standard broke a story recently of how Ahmad had been posting on the Rangers Media forum under the name IAmRangers. You can read the detail of his posts and behaviour here, but it is perhaps worth remembering that he was using this underhand method to post up confidential details of club board meetings, slating club legends Ally McCoist and Walter Smith and wrongly accusing them of attempting to take over the club. TRS received some criticism for publishing the story but I would like to reiterate that it was necessary, not for TRS but for the club. Ahmad was in the process of negotiating his terms to leave Rangers when we broke the story. He had agreed a settlement of hundreds of thousands of pounds, considerably more than his annual salary and considerably more than fans might feel he deserved. Despite this generous offer he then reneged on that and doubled his demands. Simply put, had he got his way, the club would have lost an amount of money that would have been sufficient to buy a good standard SPL player for the club. Are these the actions of a man who wants “nothing but the best for the club”? Would it have been “best for the club” for Ahmad to pocket money that supporters had invested via the IPO? Ahmad did not deserve to retain his job or get the huge payoff he wanted after leaking confidential information on forums for his own ends. He was correctly sacked. There are other things I would question about his role however. Why was Ahmad never on the PLC board? As Commercial Director you would have expected him to be. Instead it would appear he was happy to influence club affairs but not take the responsibility of a board position. Today has seen the release of a tape to the Sun newspaper of a private conversation between Ahmad and Malcolm Murray. It involves Ahmad telling Murray that he has to leave the club at the end of the season and it throws up a number of questions. Why is Ahmad, the club’s Commercial Director and not a member of the PLC board, the man tasked with essentially sacking the Chairman of the PLC board? Surely this conversation should have taken place in a board meeting? Surely a man who has never taken a board position should not have so much influence over the affairs of the board? Also, how did the Sun obtain this recording? It seems there are only two people who could have recorded it and it is clearly only in the interests of one of them to leak it to the press. Murray does not come out of this well either. His failure to properly challenge Ahmad’s assertion that he leaked information to the press may simply have been because he was taken by surprise but either way it would appear it may be in the best interests of the club for him to step down. However, Ahmad’s hypocrisy in chiding Murray for leaking information when he has been engaged in widespread dissemination of club information should not go unnoticed. Let us not forget that Ahmad also took a £50,000 fee from the club for organising a loan of £200,000. Perhaps we will see him sponsor Blackpool or Hearts next season? Has there been any noticeable increase in commercial revenue since Ahmad came on board? Was he actually doing his job or was he too concerned with playing board room politics with a board he has never been part of? It is important to clarify that this is not a defence of Malcolm Murray. I am perfectly comfortable with him leaving his position of chairman if that is the decision of the board and if a suitable replacement is found. However, Ahmad is not on the board, nor is he any longer an employee of the club after he broke the trust of the fans and his colleagues by leaking club information on forums. Tapes of private club business have now been given to the press with further leaks threatened. Who else do we know that likes to record private conversations and use them for his personal advantage and to muddy the waters in his favour? Do we want people who behave like Craig Whyte calling the shots at our club? It is one thing to record a conversation in order to have a proper corporate record of it, it is another to then leak that tape to the press to carry on a personal vendetta. Rangers’ fans deserve a board that will safeguard the club AND move it forward. We do not support individuals, we support the club and we want what is best for it. Nobody should be leaking club information whether it is Malcolm Murray or Imran Ahmad but the move to replace current board members with people like Chris Morgan is clearly taking place at the behest of shareholders who care only about the money to be made. The sooner these shareholders are bought out and the club returned to those who care about it the better. If Malcolm Murray is removed as chairman then he should not be replaced on the board by someone, like Morgan, who is there purely to safeguard his client’s investment. The decision should be taken by the board and the person appointed should be there to look after the club, not the wishes of a small group of investors. The fans invested more in the club than Blue Pitch purely on the basis of shares purchased and without even factoring the millions poured in from season ticket sales and merchandise. What will Ahmad want next? Replace Ian Hart and Walter Smith with more representatives of faceless investors? Do we want to be left with nobody on the board that we can trust to act for the club first and themselves second? I’m sure that would suit some very nicely. Does Charles Green, whose support in terms of shareholding will be crucial to any appointments to the board at the EGM, really want Chris Morgan on the board? Does he think he is the right individual to take up a position on the board of a club that Green now claims to love? Does Green even like Morgan? If not then why is his name being pushed forward by investors connected to Green? If these investors want to sell their shares then they should do so and not use threats of board appointments and leaking of private club information to get their way. Let us not forget that Charles Green and Imran Ahmad, as well as all the original investors, will make a hefty profit on their shares. There are still many questions which need to be answered. As usual the fans are an afterthought as some people play out their own selfish agendas and vendettas via the press. Walter Smith is the one man who, through years of service to our club and unquestionable loyalty, has demonstrated beyond doubt that he can be trusted. It is perfectly possible to find competent board members and employees who can drive the club forward but who do not have conflicting interests. We need a strong CEO and strong Chairman. They do not have to be people who have ever been officially connected with the club but nor should they be puppets placed on the board at the behest of those who pretend to want “nothing but the best for the club” but whose actions demonstrate the exact opposite.